The ML-10D systems were never made in production. Although design of a D system was finished and production parts were ordered, Gordon Gow decided to change the appearance of the ML systems and start a new line of XR systems. The D systems were designed to add driver and crossover protection that the C systems did not have. Fuses and indicator lights were added. The original lamps and fuse holders are shown at the right. None of the drivers were changed in the D systems. None of the original crossover parts were changed. 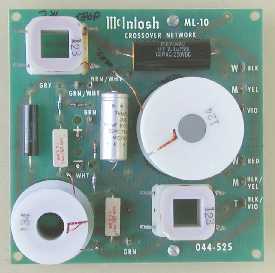 However, a new crossover board was designed to include additional connectors and lamp circuitry parts. A main fuse is added to be in series with the system. A tweeter fuse is added to be in series with the input to the mid and tweeter crossover networks. Yellow Light The yellow indicator light circuit is connected directly across the input terminals. The light will begin to be visible only when the input power to the system approaches rated power. The brightness of the light will fluctuate with the amplitude of the high power being fed to the system. This light serves only as a warning indicator. It is completely safe to operate the system under these conditions. The main fuse will blow if the system is driven excessively hard. If the fuse does blow and the system is still driven hard, the light will continue to fluctuate even though no sound will be heard. Red Light The red indicator light is connected directly across the high frequency fuse. This light will be visible only when this fuse protecting the high frequency speakers has blown. The brightness of the light will fluctuate with the amount of high frequency signal still being fed to the system after this fuse has blown. A fluctuating red indicator light will be accompanied by a severe loss of high frequencies. Power will no longer be delivered to the upper midrange(s) and tweeters until the fuse is replaced. The lamps and fuse holders are mounted on two 1-1/4" X 2-1/2" steel plates. The plates are located on the front of the enclosure behind the grille and on either side of the mid/tweeter cover. The left assembly has the main fuse and yellow light. The right side has the tweeter fuse and red light. The lights are visible through the ML-10D grille and cloth. Diodes and resistors protect the lamps. The power for the lamps is taken from the input signal to the speaker. The impedance of the lamp circuit is more than 100 times the speaker impedance and has no effect on the performance of the system. The board at the left is part number 044-525 and was used in late ML-10C production. It has the space for the additional parts. Six spade lugs at the right side connect to the three drivers. The lettering is silk screened on the board. W, M and T are for the woofer, mid and tweeter connections. The wire colors are also indicated. The left area of the board has six more spade lugs and similar wire color lettering. These are the connections for the fuses and lights. The additional components can also be seen. In updating this system to an ML-10D, I replaced the 1 mfd and 7 mfd capacitors made by Ashcroft. This is the only system that used this brand and we found a few failures later. I have replaced them with two black polycarbonate capacitors of the same value. This pair of ML-10D systems is now the only pair in existence! Since cabinets, crossover boards and cartons had already been ordered for the D systems, they were used until the new XR systems were ready for production. The fuse holders, lights and light circuit parts were not used. Jumper wires are added to the PC boards to bypass the connections. The boards were then electrically just like the original ML-10C boards that have part number 044-472. The cabinets, however, had already been modified to accept the plates. Blank plates were substituted. The cartons are the same but labeled ML-10D instead of ML-10C. Some ML-1C's were also made under similar circumstances. The new D systems were to be named the ML-1D, ML-2D, ML-2N, ML-4D, ML-4N and ML-10D. Why was the ML-10C Unique? Gordon Gow decided to market the ML systems in attractive furniture style enclosures. This meant that some compromises had to be made for driver locations because they could not all be in the same vertical line. The only exception is the ML-10C that was perhaps ahead of its time. In line mounting provides the same response on either left or right sides of the system. This in turn delivers a more accurate stereo image. In line mounting for the larger systems was not possible as it would exceed the 29 inch height of the L3C and L3M equipment cabinets and not make a matching combination with the ML2 and ML4. In addition, The ML1 would be too tall as a bookshelf speaker. Mirror imaging the drivers would have improved stereo imaging somewhat. However, this would require two physically different systems, one for the right and one for the left. Gordon felt that having two different systems would require extra stock for the dealers, particularly when a customer wanted closely matched wood grain for a pair. Despite this slight compromise, response for the larger systems is very smooth. With the use of the McIntosh reverberant room, I was also able to make the total energy output very uniform, something that was unique to our test facilities. The required use of an MQ101 or MQ102 Environmental Equalizer extends bass response within 1 dB down to 20 Hz. This made the systems very exceptional. 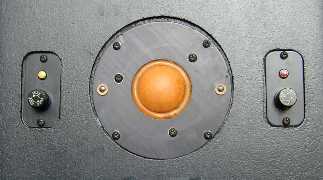 The ML systems are still preferred by many owners today compared to other speakers on the market. The grille frame is made of solid Ramen wood that is stained walnut to match the walnut veneer of the cabinet. Plastic vertical slats have a matching walnut laminate on the front. Black acoustically transparent grille cloth is behind slats. A protective screen covers the mid. and tweeter. It's made of perforated steel and is acoustically transparent. It is 10-1/4' X 6" and 1/2" deep. 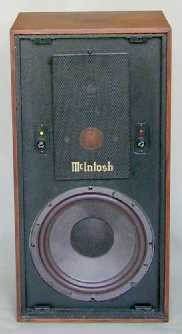 The McIntosh logo is mounted on this. *The ML-10C Requires an MQ101 or MQ102 equalizer for flat low frequency response below 150 Hz and down to 20 Hz.